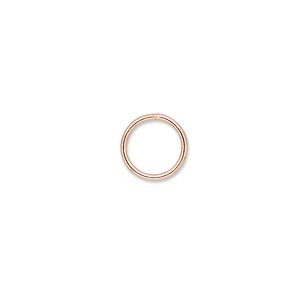 Jump ring, copper-plated brass, 8mm soldered round, 6.2mm inside diameter, 18 gauge. Sold per pkg of 100. Item Number: H20-9822FX Have a question about this item? 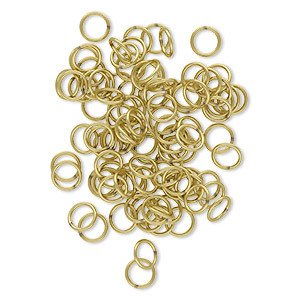 Plated brass jump rings are soldered closed--great for use in chainmaille designs, as partners for lobster claw clasps and to securely connect two open jump rings or loops. Jump ring size, gauge and inside diameter are approximate. Jump ring, copper-plated brass, 6mm soldered round, 4.2mm inside diameter, 18 gauge. Sold per pkg of 100. Jump ring, brass, 8mm soldered round, 6.2mm inside diameter, 18 gauge. Sold per pkg of 100. Jump ring, copper-plated brass, 4mm soldered round, 2.4mm inside diameter, 20 gauge. Sold per pkg of 100.